The spread of winter wheat onto the northern plains may be good news for ducks. It took a while for me to get used to the idea of winter wheat. I grew up in the farm country of Iowa and Illinois. We didn't farm, but most of our relatives did, and like most Midwesterners, we kept an ambitious garden, canned our tomatoes, froze our green beans, and put up a special taco sauce that would etch the inside of a Mason jar. From the time I was six or seven, I was involved in the primal rhythm of the agricultural year--break ground in the spring, cultivate (which is to say, hoe weeds) all summer, harvest in the fall. The pattern was no different for the full-time farmers around us. The fields were bare black dirt in May, emerald green in July, tan and ripe in October. After I finished college, the vagaries of the job market led me to southern Kansas. With the advent of center-pivot irrigation, Kansas farmers had their choice of several crops--corn, milo, sunflowers--but this was still the middle of the Wheat Belt, and dry-land wheat was still king. Winter wheat, which was the confusing part. The fields were plowed and planted in September; they greened up like suburban lawns with the moisture of early winter, then lay under the snow until March. By May, the fields were waist high in grain, and the harvest was in July. Backwards. In a part of the world where summer drought is a way of life, backwards isn't necessarily a bad thing. A plant that can sprout in the fall gets a running start the following spring with the moisture from snowmelt and first rains of the season. It shades out annual weeds before they get started and ripens before the worst of the insect pests and diseases have a chance to attack. The trick, of course, is to avoid being frozen solid during the winter. Plants vary in their ability to withstand cold. Among the small grains, rye tends to be most tolerant of low temperatures; wheat tends to be most vulnerable. The first strains of wheat that could make it through a prairie winter came to the New World with Moravian farmers from Russia who settled in Kansas, bringing with them a variety that not only survived the winter cold but needed the chill in order to set seed the following spring. Kansas provided a fortunate combination of relatively mild winters and enough snow to insulate the young plants, protecting them from the occasional arctic front. Winter wheat quickly became an agricultural staple on the central plains. Still, there were limits to the cold winter wheat could take. On the northern plains, where winter temperatures could drop past 50 below and the wind could scour a field of its insulating snow, farmers stuck with spring wheat and a little winter rye. "The acreage devoted to winter wheat in the three Prairie Provinces taken together amounted in 1918 to only two-fifths of one percent of the total wheat acreage. The climatic factors which tend to kill winter wheat are: (1) very low temperatures during the winter, (2) the relative absence of snow locally, (3) alternate freezing and thawing in spring, and (4) drying winds in spring." Over the next three generations, plant breeders did their best to develop varieties of wheat that could handle the rigors of the northern plains, and they enjoyed some success, but the breakthrough that brought winter wheat north had as much to do with new farming techniques as it did with new plant genetics. Minimum-till agriculture allowed farmers to leave most of the residue from the previous year's crop instead of turning it under. Minimum till was made possible by new sweep plows that allowed farmers to slice under the residue without disturbing it and a new generation of herbicides that kept annual weeds from invading the field after harvest. With no weeds to discourage, farmers could skip the classic plow-and-disc cultivation that had always preceded planting. By leaving the residue, farmers could conserve the moisture in the soil and maintain a rough surface that caught snow over the winter. The snow provided the insulation necessary to get a crop of winter wheat through the winter and gave the young plants an extra shot of water first thing in the spring. With the schedule for field work turned backwards, farmers could plant during the relatively dry months of fall and reap the full advantage of spring rains. 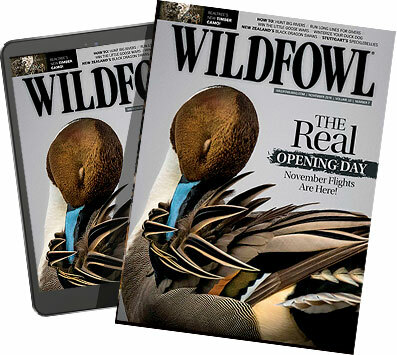 As early as 1948, researcher John Earl reported that winter wheat "proved to be the most important nesting cover for mallards" in the Sacramento Valley of central California. Forty-three-percent of the nests he found were in wheat fields, even though wheat made up just seven percent of the dry-land cover on his study area. In the mid-1980s, waterfowl biologists Harold Duebbert and Harold Kantrud looked for duck nests in North Dakota no-till winter wheat. They found five species nesting in wheat fields--blue-winged teal were the most common, followed by pintails and mallards. Density of nests varied for reasons Duebbert and Kantrud couldn't identify--one field in the southeastern corner of the state had 75 nests per square mile, but the average was much lower, around 18 per square mile. Compared to the densities of ducks nesting in the best native cover, these densities aren't high--a study by Ken Higgins in North Dakota at about the same time found 41 nests per square mile of idled grassland and 777 nests per square mile of fencerow or grassy waterway. Still, winter wheat attracted far more hens than other kinds of annually plowed cropland-- Higgins found about five duck nests per square mile of summer fallow, mulched stubble, or standing grain stubble. Of course, a field that is plowed in early spring offers no cover at all for a nesting duck after the tractor passes. Often, these fields prove to be ecological traps for early arrivals like pintail that nest in stubble before spring cultivation starts. The plow destroys the nest and may kill the hen that built it as well. While Duebbert and Kantrud didn't find a great concentration of nests in winter wheat and barley fields they searched, they did find that 27 percent of the nests in wheat produced ducklings. This is two to four times the hatching rate in other kinds of cropland. The two researchers concluded "the trend toward increased planting of no-till winter wheat will have a positive impact on production of upland nesting ducks." ever been found before. Twenty percent of the nests survived to hatching. Biologists on another DU research project compared the number of nesting ducks in minimum till fields that were seeded in the fall with the ducks in a field planted in the spring. They found 71 nests per square mile in the fall-planted stubble, only eight nests per square mile on the spring-planted fields. On average, 22 percent of the nests in the fall-planted fields hatched; only three percent hatched in the spring-planted fields. Even before DU finished its research, the Canadian branch of the organization had moved to encourage the transition to winter cereal grains. In the early 1990s, DU Canada began offering incentives to farmers. By 1999, the payment was $10 an acre for fall rye, winter wheat, or winter triticale, and DU paid on more than 80,000 acres of cropland in Saskatchewan and Manitoba. In addition, DU has been working with plant geneticists at the University of Saskatchewan in Saskatoon and at the Lethbridge Research Centre, a Canadian crop research laboratory in Alberta, to develop more cold-tolerant varieties of wheat and other cereals for use in the Canadian grain belt. In 2005, Canadian farmers planted 750,000 acres of winter cereals. In 2006 that acreage increased to 1.2 million acres and in 2008, it rose to 1.5 million acres. Dr. Ross McKenzie, an agronomist with Alberta Agriculture and Rural Development Department, is enthusiastic about the crop's potential. "Including winter wheat in the crop rotation spreads out the workload and results in good time management for farmers," he says. "In most years, winter wheat potentially can be up to 20 percent higher yielding than spring wheat, making it an economically attractive crop." In 2007, farmers in the Prairie Provinces planted nearly 20 million acres of wheat. If they take McKenzie's advice, prairie ducks could see the largest ecological change on their breeding grounds since the arrival of the plow. Winter wheat isn't a panacea. We probably can't depend on it to produce as many ducks as extensive native grasslands, and it provides little winter cover or forage for resident game species like sharptails, gray partridge, and pheasants. Still, if we're going to farm the northern prairies, winter wheat and fall rye at least soften the impact of our appetites. If, in the first chilly weeks of April, I'm given the choice between a stand of green wheat and a fresh-plowed field, I'll take the wheat. So will a hen mallard.